Before we discuss the differences or the actual terms, I feel it is important to know what they mean and how they are used. Let us come to know it in detail. It is the fundamental unit of information that we use in our computing and also in communications. The word ‘binary digit’ is shortened to form the word ‘bit’. Therefore, we use bits in all our binary digit computations. The computation and communication here mean the digitals ones. Yes, we are not speaking about the analog! A bit can have either of the two values, ‘0’ or ‘1’. The ‘0’ is usually referred as ‘off’ state and a ‘1’ as ‘on’ state in digital processing. The other forms of representations of these values are ‘+’ or ‘-‘, ‘’Yes’ or ‘no’, ‘true’ or ‘false’ or any other values that can have only two opposite attributes. We all know that the communication and computation in digital fields take place with the basic element called as the ‘bit’. In most of the times, the results are stored as binary numbers and whose length is referred to as the binary number. It is always referred as ‘b’ in the digital electronics. A byte is the unit of information that is used in digital fields and is equals eight bits. We generally address the memory spaces in terms of bytes and it forms the smallest addressable unit of memory space that is been used in computer related technologies. It is referred as ‘B’ in the digital electronics and we should note that it forms the different notion from that of a bit. So an eight-bit can also be called as a byte or simply with ‘B’. We shall write the above-mentioned notions here, to understand it better. 1 bit = ‘0’ or ‘1’, ‘true’ or ‘false’, ‘+’ or ‘-‘ in its values. It is denoted as ‘b’. For example, it can be written as 1 b.
It’s bit length = 1. 1 Byte = 8 bits. It is denoted as ‘B’. For example, it can be written as 00011101. It’s bit length = 8. The capitalization of alphabets means a lot in these notions. A bit is simply written as ‘b’ whereas a byte is written as ‘B’. We have already discussed what they are and what values they can hold. The letter ‘m’ here means Mega. The value 103 is noted simply as Mega so that we can use it in our digital computations with better understandings. When we find a notion as ‘mb’, it means megabits and ‘MB’ means Mega Bytes. So we should give importance to the capitalizations here as they are interpreted differently with respect to ‘b’ or ‘B’. 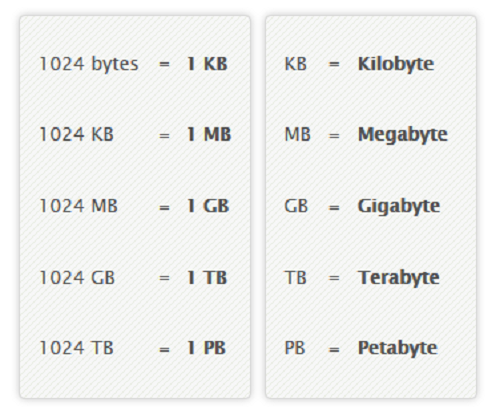 As we have discussed earlier, the capitalized alphabets denote the Bytes and so ‘MB’ means Mega Bytes. Most people get confused with these notions and they use it differently or wrongly at places where’ mb‘ or ‘MB’ has to be written. Be cautious about it and just pick the right one. The abbreviation ‘mbps’ means megabits per second and it is always used to denote the speed of transmissions. You might have heard it when you opted for a broadband connection. Did your Internet Service Provider (ISP) mention something like mbps? Hope, you are recollecting it! For sure, you must have heard it. A 10 mbps connection means that the channel sends 10 megabits per second through it and the more the value is, the more the speed is! It can also be written as ‘mb / s’. What do ‘MBps’ or ‘MBPS’mean? As a capitalized ‘B’ denotes a Byte, ‘MBps’ or ‘MBPS’ here means MegaBytes per second. It is also used to specify the speed of transmissions through a communication channel or any electronic device. So, a 10 MBps connection means that it is capable of sending or receiving 10 MegaBytes per second. From our previous discussions, it is clear that ‘mbps’ means megabits per second and ‘mb’ means megabits. The notion ‘mb’ is used to denote the storage capacity of any electronic storage device but the term ‘mbps’ denotes the speed of transmissions through a channel or a device. Though the terminologies are sharing the same root word and meanings, they are used to represent different context. Look at the example below to get a clear idea. An ISP with 10 mbps means that it can send or receive files at the rate of 10 megabits per second through its channels. We cannot express it as just 10 mb. But at the same time, we can say the capacity of a storage device such as a floppy disk or anything as 10 mb. Here, we cannot express as 10 mbps as it refers to the speed of transmissions and the 10 mp floppy disk means that it can hold data of up to 10 megabits. 10 mb capacity floppy disk. I have ISP connection of 10 mbps speed. I have a floppy disk of capacity 10 mb. Let us look at the above notions and differences in a tabular form. 1. Bit It is the unit of information that we use in our computing and also in communications. The word ‘binary digit’ is shortened to form the word ‘bit’. It can have values such as ‘on’ or ‘off’,‘+’ or ‘-‘, ’Yes’ or ‘no’, ‘true’ or ‘false’ or any other values that can have only two opposite attributes. 2. Byte It is the unit of information that is used in digital fields and is equals eight bits. 3. mb Mega bit. It equals 103 bits. It is used to denote the storage capacity of any electronic storage device. 4. MB MegaByte. It equals 103 Bytes. 5. MBps or MBps or MB /s MegaBytes per second. It is used to specify the speed of transmissions in terms of Bytes. 6. mbps or Mbps or Mb /s Megabits per second. It is used to specify the speed of transmissions in terms if bits. 1. It can be abbreviated as megabits. It can be abbreviated as megabits per second. 2. It denotes the capacity of any electronic storage device. It denotes the speed of transmission of a channel. 3. For example, A floppy disk of storage capacity = 10 mb. For example, an ISP of 10 mbps speed. The article gives an idea of what these notions are and is specifically written for the non-technical persons. If you still feel that something can be added, please let us know. Ramalan Harifa. "Difference between mbps and mb." DifferenceBetween.net. July 24, 2017 < http://www.differencebetween.net/technology/internet/difference-between-mbps-and-mb/ >.